Fact: You’ve been eating all wrong to prevent and reverse heart disease. For decades, low-fat and low-cholesterol diets have been touted as the way to prevent and reverse heart disease. In the groundbreaking book, The Great Cholesterol Myth, Jonny Bowden and Dr. Stephen Sinatra debunked that assertion, arguing that fat—often curtailed on traditional low cholesterol” heart-healthy” diet—is not the enemy and may in fact be part of the solution. The grains and carbohydrates that are often substituted for fat and healthy proteins in traditional “low cholesterol” diets may exacerbate the problem. In short, a diet low in sugar and other inflammatory foods and ingredients and high in healthy fats, protein, antioxidants, and key nutrients is the best course of action. 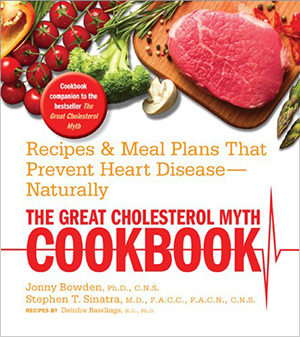 In The Great Cholesterol Myth Cookbook, nutrition expert Jonny Bowden lays out a detailed meal plan and 100 delicious and nutritious recipes that will prevent and reverse heart disease, target key factors like inflammation and HDL cholesterol, provide key nutrients, and give you back foods you thought were gone forever.